* Sponsored content: This article was created by Marketing in collaboration with Teradata. The Econsultancy report mentioned in this article, ‘Enterprise Priorities in Digital Marketing‘, is available free for Marketing readers. 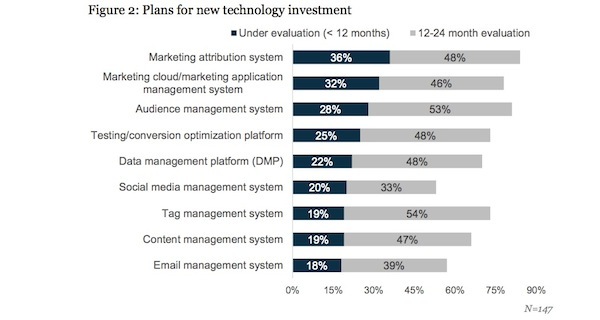 Marketing attribution systems top the list of short-term technology investment priority areas for senior marketing decision-makers, a study by Econsultancy has found. 84% of senior marketers say they plan to invest in marketing attribution systems in the near term, says a study published by Econsultancy, in partnership with Teradata. 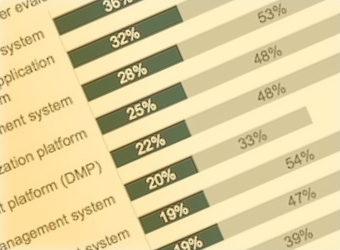 Marketing attribution systems topped the list of strategic priorities for technology investment, followed by marketing cloud systems, audience management systems, conversion optimisation platforms and data management platforms. The report, ‘Enterprise Priorities in Digital Marketing‘, is based on a survey of 402 senior marketing decision makers from global enterprises, and aimed to provide specific benchmarks from digital marketing leaders at enterprise organisations. The report focuses on the technology, the strategies they support and the marketing budgets. According to the report’s authors, companies are moving away from “simple platitudes” towards optimising the investment of their hard-won budgets. Respondents were asked about technologies not currently in use at their organisations: those currently under consideration as well as those that are expected to be under consideration with the next two years. Rankings in the above graph reflect both the priority and the penetration of a given technology. For example, most companies have email management systems in place. 18% are looking at evaluating them in the next 12 months. Marketing attribution systems, on the other hand, are seeing demand both from those organisations looking to implement the technology for the first time and those evaluating a replacement. Econsultancy reports that only 35% of enterprise companies currently use a marketing attribution system in-house. In social media, respondents from Australia and the UK are more likely than those in other markets to be reviewing social media management systems, having lagged somewhat in early implementation. About this research: This report is based on a survey of 402 senior marketers from global organisations. All respondents are with companies having more than $500 million in revenue, with 56% having revenues over $3 billion. Respondents were from a wide variety of industries, with an emphasis on automotive, consumer goods, consumer technology, retail and travel/hospitality. Only respondents who reported that they were decision makers or influencers in the marketing budget allocation process were shown budget-specific questions. Other respondents were asked questions about digital marketing and related technologies as well as corporate priorities and challenges. The survey was conducted in July of 2014, using a questionnaire developed by Econsultancy.